Sheikha Lubna Al Qasimi is one of the most easily recognisable government officials of the United Arab Emirates (UAE), primarily because of her numerous achievements in both the public and private sectors. Her global prominence was highlighted recently when she was named among the 2009 Forbes List of the 100 Most Powerful Women in the World. 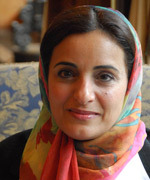 Sheikha Lubna was appointed as Minister of Foreign Trade in 2008 having previously spearheaded the UAE’s Ministry of Economy during one of the country’s most economically prosperous periods in history and became the first woman ever in the country to assume a cabinet position. Prior to joining the government she was one of the country’s pioneering women professionals in the field of computer engineering with extensive experience working with a number of well-known firms, ultimately leading her to a post at the Dubai Ports Authority. She was then named Chief Executive Officer of Tejari, which she guided to become the premier electronic business-to-business marketplace for emerging markets and where she continues to serve as a board member. Sheikha Lubna has received many awards for her work including the Vital Voices Global Trailblazer Award 2008, for her exceptional leadership in the Middle East and her profound influence on future generations of Arab Muslim female decision makers. In 2009, Nicolas Sarkozy conferred on her the Chevalier de la Légion d’Honneur, the highest possible distinction, for her extraordinary achievements as a public servant of the UAE and for her invaluable role in enhancing her country’s foreign relations. She also received an Honorary Doctorate of Science from California State University for her contributions to the field of science and technology.